The Family Vacation is here finally! Your Family Vacation is finally here! You can already imagine yourself sitting on a lounge chair, sipping a margarita and watching the kids build a sand castle under the sun. Good times…. No, the kids will not have a final say. But asking everyone for their opinion will not only avoid drama, you may even learn something new from them. If you give your family a chance to voice their opinions, they are also more likely to get involved and cooperate. After all, it is a family vacation. The perfect destination is not just a beach. It’s important to thoroughly investigate each place you are considering. A picture perfect beach could turn out to be too rocky or the tide might be too strong. For a great family vacation, you must be sure the conditions are ideal for adults and kids. A resort with a thousand 5-star reviews might not necessarily be the best place for your family. Make sure it covers your interests, as well as your partner’s and your kids’. Choosing the right meal plan is also important. A European Plan can turn out to be more expensive than an All Inclusive if your family enjoys sipping cocktails and eating snacks by the pool or beach all day long. Everything can go south if the little ones get bored. 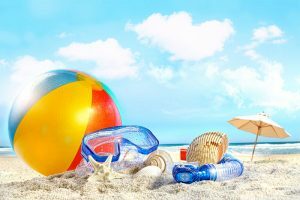 You might be ok with reading and sunbathing all day long; but a resort with a full entertainment program can keep the kids enjoying activities and burning the extra energy from the sugary drinks. It will also give the parents some extra time alone. We all know sunscreen is important, but it can also be quite a hassle. So remember to make it fun. You can avoid a lot of tragedies if the kids enjoy it. Some resorts even offer a Pool Concierge that will help you with this kind of detail during your family vacation. In case of someone gets a sunburn, you can freeze some aloe vera gel in an ice cube tray and apply it on the skin. During a family vacation, make sure to plan some activities that everyone will be interested in. For example, a toddler in a museum can turn out as chaotic as a teenager in a kids restaurant. Find activities that everyone can enjoy so that you can have a great family time. Extra Tip: Something better for families! All families are different; therefore, special perks should be planned according to each family. That is why, at Marival Residence Luxury Resort®, we offer the exclusive Family Emotion® Program. This program will allow you to choose the perfect accommodations, get special amenities and have access to a personalized concierge that will help you plan every part of your vacation. Yes, the smaller the children, the more surprises will be awaiting you. The good news is that planning is actually good for your health! Or at least your happiness. So start your research and keep in mind: memories last forever!